Upon arrival of the Mosque, we went into a room to meet all the Muslim elites and the head Imam named Moulana Aboul Haque. Vassula greeted the head Imam in Arabic as he was surprised to hear her speak Arabic. Everyone was introduced and they were so gracious in meeting everyone. To their great surprise Vassula spoke to them in fluent Arabic all the while during their conversation. The fact that she spoke Arabic made them feel somehow closer to her, since all of them should learn this language to be able to read the Koran. Imam Islam (who joins us on our pilgrimages) had organized this meeting. 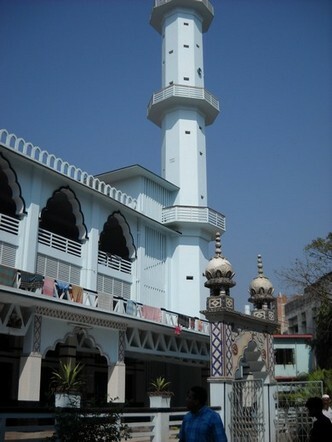 On the premises, was the dormitory that houses two thousand young boys that are studying Islam. Matthew Mitra, from the Baptist Church, asked a question as he read about it on Wikipedia which he had printed out with him, about the encounter with her guardian Angel Daniel and asked her to explain it. Vassula continued to explain how she saw her guardian Angel in a supernatural way. She also informed them of the thirty three Beth Myriams that are around the world to feed the poor .She mentioned that faith is not enough and we must do something for the poor. It is part of the mission to help the poor and feed them. 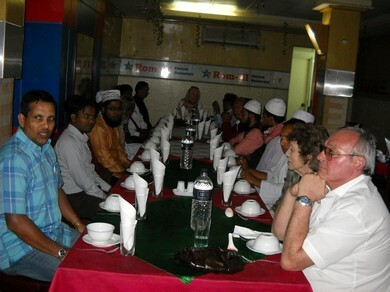 We then were invited to have lunch together with the Muslim clerics .We went to a Chinese Restaurant Rom III.